Good afternoon. Earlier this morning, I spoke at a housing forum and I am here on the subject of youth. Incidentally, both housing and youth are major policy priorities for this term of the HKSAR Government. But I say that it would be oversimplifying the issue to try to equate youth unhappiness that Eric talked about, with home ownership. I think there's more than that. I welcome inputs from experts and representatives from various sectors which will no doubt help shape our respective policies in these two very important areas. First of all, I would like to express my appreciation to the Asia Society Hong Kong Center and JP Morgan for launching this "One Step Ahead" initiative in 2014. The initiative comprises a programme of roundtables and symposia held twice a year across the region, and provides an excellent opportunity for experts and stakeholders to provide insights, generate ideas and promote collaboration on issues related to economic growth and development in Asia Pacific, with a focus on workforce readiness. Indeed, with major advances in technology, every economy has to ensure the readiness of its workforce to embrace changes brought about by such developments. The nature of the global economy and Hong Kong's place in it is evolving quickly. 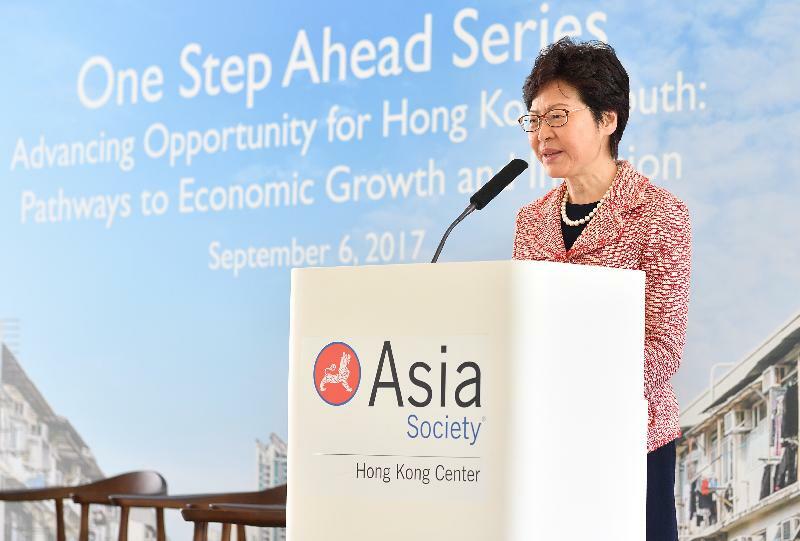 For Hong Kong to stay "one step ahead" of the competition, it is paramount that we create opportunities for our next generation, while at the same time nurture and inspire them so that they have the necessary knowledge and skills to grasp such opportunities and realise their potentials. Against such background, the theme of this forum, "Advancing Opportunity for Hong Kong's Youth: Pathways to Economic Growth and Inclusion", is indeed very relevant to our city's future. Our future naturally lies in our economic development. Indeed, diversifying Hong Kong's economy to create better jobs, as a topic, is the lengthiest chapter in my Election Manifesto, running into a total of 59 paragraphs. In a nutshell, we should consolidate and enhance our traditional industries, namely financial services, shipping and logistics, professional services and tourism and press ahead with at least two emerging areas which I think will provide ample economic opportunities to our youth in the future. One is innovation and technology, and the other is creative industries. In my Manifesto, I have pledged to create a favourable environment in terms of policy, funding, land, talents and promotion to develop these industries in Hong Kong. On innovation and technology, I have stated that the Government should be more determined and confident, play its role as "facilitator" and "promoter" to the full, and help the industry remove constraints and catch up with the ever-changing international trends in innovation and technology. In particular, the Government will press ahead with the Hong Kong/Shenzhen Innovation and Technology Park, which I helped to seal a deal earlier this year, and will endeavour to develop Hong Kong into a Smart City. To be frank with you, I believe that Hong Kong is lagging behind in this aspect. For example, while Mainland China is moving quickly into a cashless society, and I visited one of these societies in Hangzhou earlier last month, we still very much need cash to live in Hong Kong, say to pay for taxi fare, to eat in a "cha chaan teng", etc. There is a lot of catching up to do, but it also means that there are a lot of room to develop and a lot of opportunities for our youth who would like to pursue a career in this field like Mr Lam's GoGoVan. As for creative industries, it is an area with great potential for young people in Hong Kong who we all know are very creative, especially in performing arts, computer design, comics and animation as well as film making. The Government's role will be to remove barriers hindering the development of creative industries, and create the right conditions for young people to develop their potential. The West Kowloon Cultural District will provide the platform for nurturing our creative talents. Whether in consolidating the traditional pillar industries or embarking on emerging industries, Hong Kong is now in the right place and at the right time. The Belt and Road Initiative and the Guangdong-Hong Kong-Macao Bay Area development have given us tremendous opportunities. And I am already seeing some of this at work. I see a lot of room for us to collaborate with the Mainland, especially our neighbouring Shenzhen. Last week, I made a day-trip to Shenzhen, during which I had the chance to see the many achievements of the co-operation between Hong Kong and Shenzhen in technology and creative industries in recent years, and to explore with the Shenzhen Municipal Government room for the two places to collaborate further. During the day, I visited the Innovation and Entrepreneur Hub in Qianhai and the Shenzhen-Hong Kong Youth Innovation Entrepreneurship Base in Nanshan. They provide both working space and living hostel, multi-faceted and systematic training and educational programmes, as well as the chance to exchange ideas and collaborate for young entrepreneurs from the Mainland and from Hong Kong. From my exchange with some of the young people there, I learnt that they are impressed by the strong innovation and entrepreneurial atmosphere there. They all look forward to turning their ideas into reality and starting their own business. One or two of the young people told me what they now need is some angel funding. Maybe not all of them will succeed, but such entrepreneurial spirit was pivotal in making Hong Kong's economy boom in the past, and will be essential for our future. Measures have already been put in place by the Hong Kong Special Adminitrative Region Government to support our young entrepreneurs. Last year, the Government set up the $300 million Youth Development Fund. The fund works with Non-Governmental Organisations (NGOs), providing matching grants to assist young people in starting their own businesses. The NGOs also provide mentorship programmes to help these young entrepreneurs. One important characteristic of the Fund is that no geographical restriction would be imposed. In other words, young people who plan to start their own business in the Mainland would also be eligible for funding support. In this connection, we would continue our work with our Mainland counterparts to encourage young people of both places to jointly establish business start-ups or to collaborate in other forms. To nurture talent in preparation for new economic opportunities, my Government will invest heavily in Education. I have put forward a series of initiatives in my Manifesto to promote quality education. After obtaining the funding approval from the Legislative Council for a recurrent commitment of $3.6 billion, we have already implemented a number of these initiatives, including a new annual subsidy of $30,000 for students pursuing self-financing undergraduate programmes in Hong Kong; and $5,000 for students pursuing eligible undergraduate programmes in the Mainland. This is a significant commitment by the Government because we have set no quota for these subsidies. We do however firmly believe that it is money well spent, for these subsidies will not only ease the financial burden on students, but also broaden their choices for their study and their career. Apart from picking up knowledge and skills in schools, we also encourage our next generation to expand their horizons so that they will be better equipped in an increasingly globalised economy. To this end, we have been stepping up our student exchange and internship strategies. We take full advantage of our close relationship and experience with the Mainland. Just across the boundary in Guangdong Province, close to 1 000 internship places have been provided this year at enterprises, agencies and organisations under the Funding Scheme for Youth Internship in the Mainland. A bit further up north, we recently established two new internship programmes across the boundary, which are proven to be very well-received by the students: one is the Beijing Palace Museum Conservation Internship Programme in Beijing and the other is the Sichuan Wolong Nature Reserve Internship Programme in Sichuan Province. The aim is to nurture future talent for nature and heritage conservation in Hong Kong. We are fully aware that not all young people would like to become entrepreneur, and in fact not all young people do well in school. In this regard, we do have a dedicated Youth Employment and Training Programme for those who leave school at a relatively young age with educational attainment at sub-degree level or below. The Programme provides comprehensive pre-employment and on-the-job training to enhance their employability. Under the Programme, customised career guidance and employment support services offered by professional social workers, pre-employment training, workplace attachment and on-the-job training lasting for six to 12 months are given to young trainees. To encourage employers to provide young people with on-the-job training opportunities, the Programme also offers employers training allowance. The Programme has been a success in promoting youth employment, as our survey revealed that more than 70 per cent of the sampled trainees in the past six years were in employment while 12 per cent to 20 per cent of the trainees were either pursuing further study, attending training courses or taking up employment soon. Ladies and gentlemen, there is no shortage of projects or programmes to support our young people. What I have shared with you is only a sample of those projects and programmes that the Government is running. My government's biggest challenge lies in connecting with young people. I appreciate that young people have great hopes and aspirations for the future of Hong Kong. I also understand that they have their own ideas and views on social issues. Proper recognition should be given to the passion and commitment of our youth towards our city. Thus, apart from identifying for them economic opportunities, we should give greater opportunities for them to participate in public affairs. Actually next time if you have a luncheon discussion on this, you should invite more young people to come. In the long term, it is incumbent upon us to nurture social leaders and politicians through encouraging young people to take part in public affairs. A Youth Development Commission to be chaired by the Chief Secretary for Administration will shortly be established. Relevant bureau and departments will also start to roll out more measures. This Forum is a timely one to enrich our discussions and to provide pertinent observations on the issues we are facing. I look forward to hearing your views on how we could advance opportunity for our youth and for the betterment of Hong Kong. I wish you all a very successful Forum and a very happy lunch.